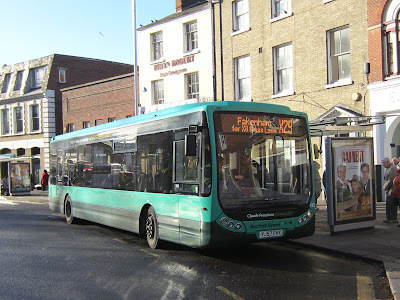 Norfolk Green's 21 SN12EHM was being used on the X29 route between the city and Fakenham. 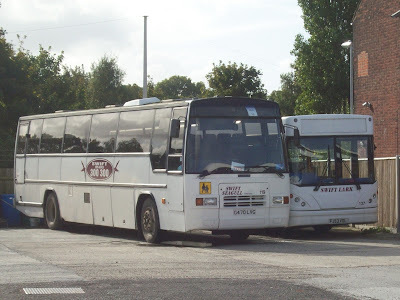 'After reading the various blog features regarding the ex Yorkshire Rider Darts of various types working with FEC, it reminded me that deep in my photo archive were images of a couple of Darts that first appeared with FEC from Yorkshire and worked in their Northern liveries here. 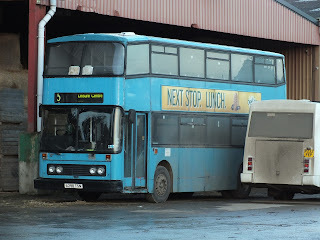 from Halifax on loan at Yarmouth to operate the summer 3 service, newly renumbered into First's national fleet 40634 & 40635 M265/266VWW ( ex 3265/3266 in Rider Group). Both photographed at Caister Road. Another example arrived in Leeds Citylink livery in the shape of M230VWW gaining FEC fleetnumber 354, seen here in Surrey Street Bus Station, Norwich, this went on to be repainted into a version of Barbie 2 livery minus the pink fades. Many thanks for the report and photos Grahame. 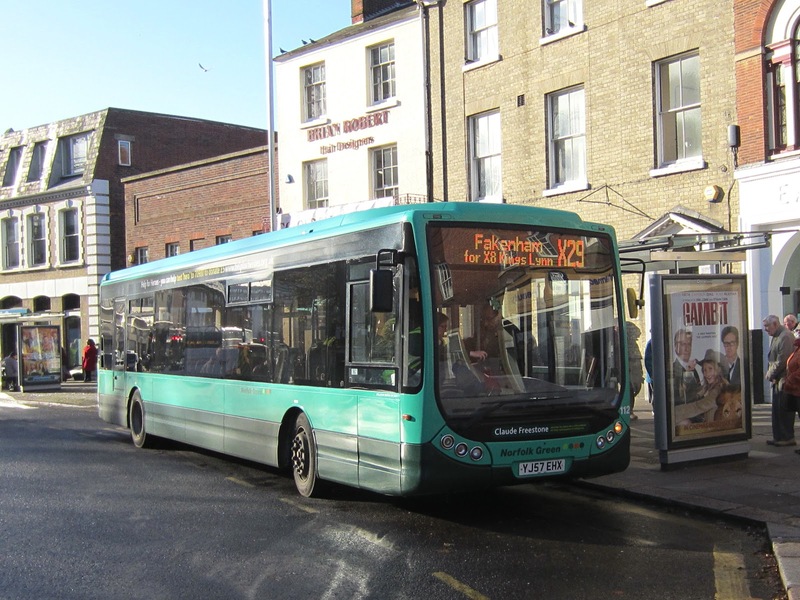 The service to the North Norfolk Coast has a journey time of approximately seventy minutes and will operate at hourly intervals between Mondays and Saturdays and every two hours on Sundays. May another Yorkshire exile in North East Norfolk be permitted to assist Michael Sayer's memory? 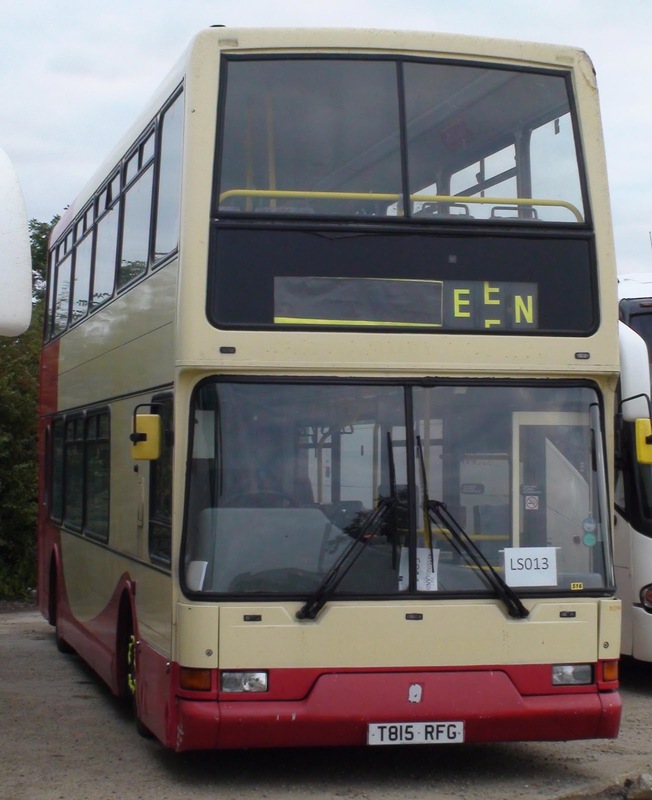 The batch of 68 Darts M201-268 VWW were numbered 3201-3268 when new. Only the first 18,had Plaxton bodies; they went new to Huddersfield, at the same time as a much larger batch of Dennis Lance/Plaxton Verdes numbered in the 4xxx series, and a host of Mercedes Benz minibuses in the 2xxx series. 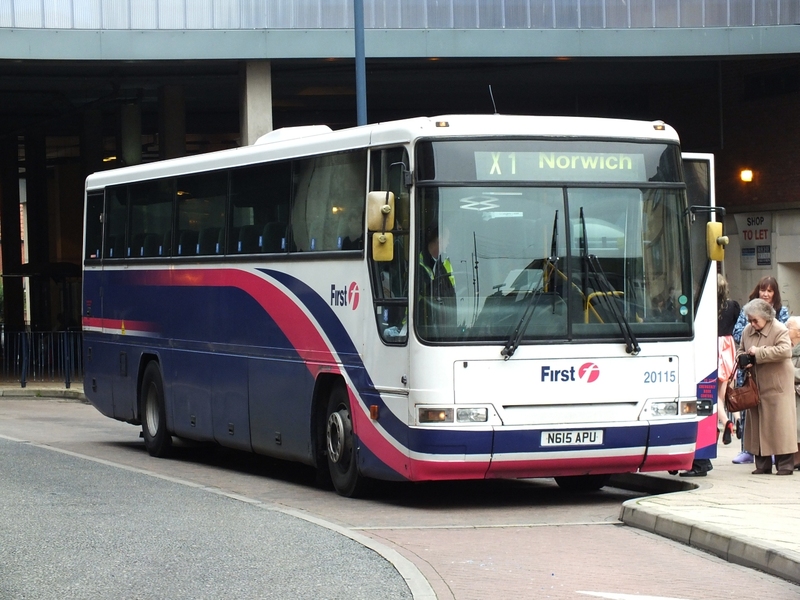 The bus was originally due to be withdrawn in Great Yarmouth but has since found further work; although it may be in its last few days of service with First Eastern Counties. 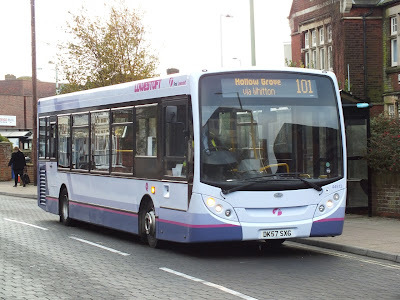 James Race got a photo of her this morning on the 101 Lowestoft Town service at Gunton Estate. As you may know Yorkshire Rider buses 4201 to 4225 (M201 - M225 VWW) were delivered new to the Huddersfield depot in 1995 and I know from my time at First Great Yarmouth that most of them found their way into the FEC fleet and some of its sisters were at Caister Road . Thanks for the story of 47218 and its sad end . 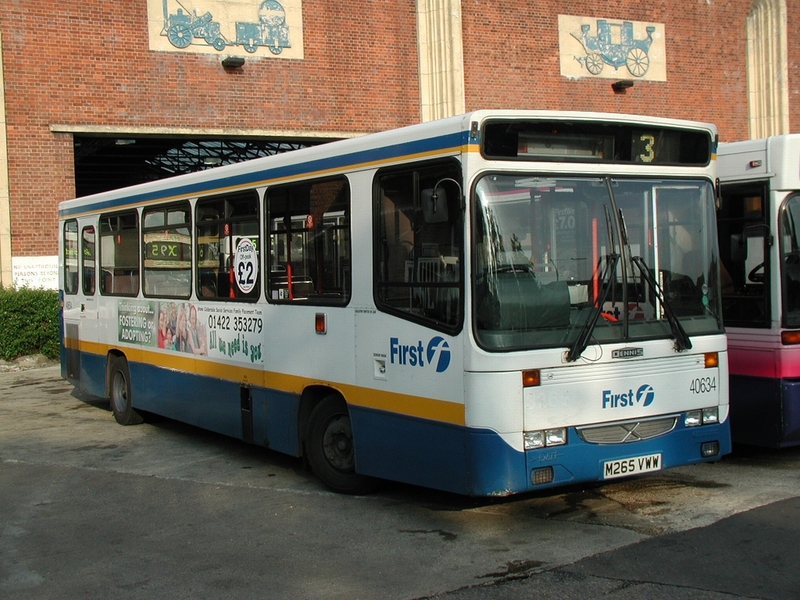 It was a bus I drove nearly every early shift at Yarmouth as it was nearly always allocated to the 0637 to Lowestoft , which ran in at 0830 , and the bus then went empty to Norwich to run the 17/17A. As stated previously the bus meant a lot to me ,as I had also driven it in Huddersfield. On my return to Huddersfield in 2006 I worked part time , and did the same 5 hour shift every day so often drove our 42178 (P708HPU), a bus I took to my heart as it had nearly the same number as my favourite Yarmouth bus ! 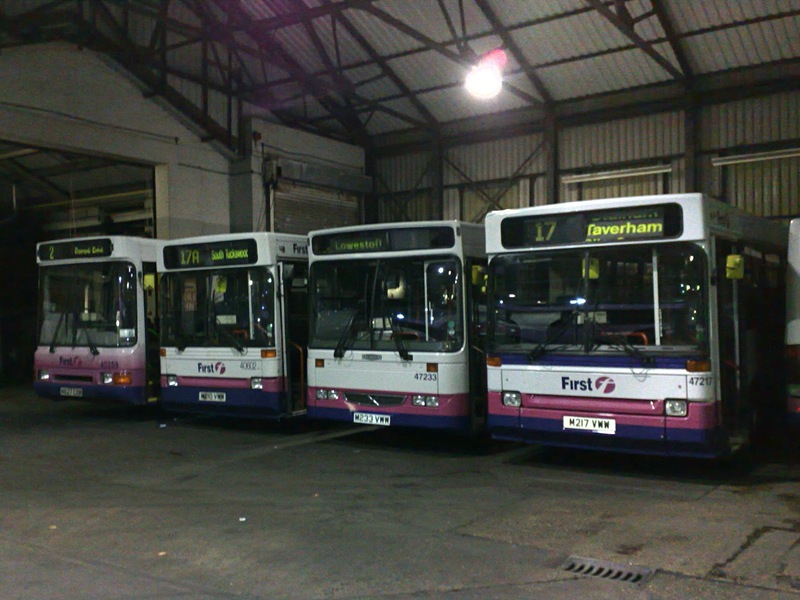 The depot staff made sure it was held back for me on my last day to drive after 40 years on Huddersfield's buses ! Out of interest in the picture I sent you , my first trip each day was a 314 to Holme . Holme is a lovely tiny Pennine village at the base of Holme Moss . The route went through Holmfirth , famous as the filming location for Last Of The Summer Wine . Many an afternoon myself and 42178 trundled past Compo's cafe and Nora Batty's cottage ! One last item regarding the surprising links between here and the Huddersfield area also needs to be mentioned. 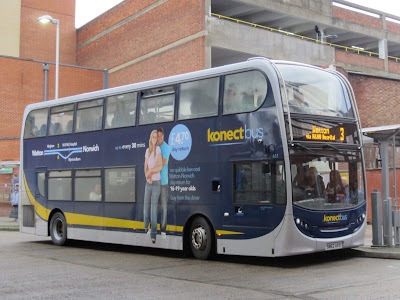 After branding for the Lowestoft-Kessingland service had been fitted to R458BNG, it was surprisingly whisked off to Huddersfield depot! As a result it never became 43458 in line with the rest of the batch when the five figure numbers arrived, and recieved 40881 instead; so is often overlooked by local enthusiasts. I have sent a photo of her taken in 2009 in Halifax. Are Reynolds expanding? I ask because I see reports and photos of newly acquired vehicles, but none of any withdrawals. Unfortunately the new arrivals seem to attract the attention and are reported more than departures are! I was fascinated with the latest blog entry about the similar lives, but it doesn't end there! Not only did I go to Huddersfield myself a number of times to collect Darts for use at Gt Yarmouth ( being picked up from the Railway Station by a friendly chap in the company van who also used to work for Huddersfield Corporation although I cant remember his name) but the bus Michael remembers so fondly, ex Yorkshire Rider 4218, was driven on its last journey by none other than James Race! It was operating on the 22:11hrs service 99 from Southwold on 26th November 2009 when it failed at Wrentham. It was rescued by a tow truck and never ran again. 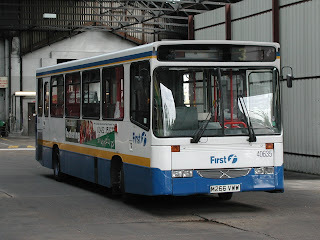 James has a photo of it actually taken on the fateful evening, with only a few more miles of service to go, as well as a later photo at Gasworks Road when it was being used for spares. Its a small world, but an interesting one! Following Syd Eade's report on the blog regarding the first and last vehicles he drove whilst working for Eastern Counties and First Bus, I was contacted by Michael Sayer, a Norfolk exile. "I always read your fasinating blog . I was so interested to read about Syd , who took a photo of the last bus he drove before retiring. I followed a parallel life up here in Huddersfield!! 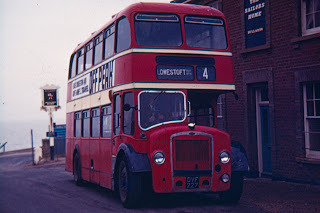 I joined the then Huddersfield Corporation Transport in June 1972, and worked for the same company all my life . Just like Syd in Lowestoft I saw many changes. 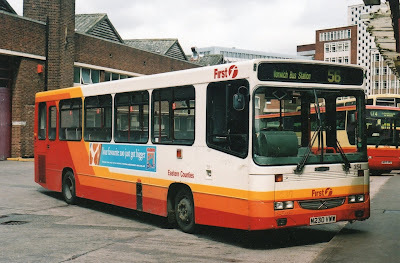 Huddersfield Corporation sold its buses in 1974 and we became MetroBus, and eventually the famous Yorkshire Ride , which in turn was sold to Badgerline until we became part of First Bus in 1996. 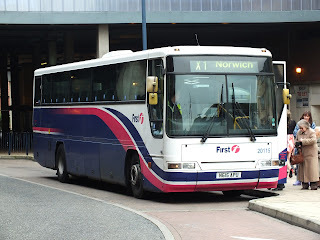 Out of interest in 2005, I went on a transfer to First Great Yarmouth ( my town of birth) for 7 months . 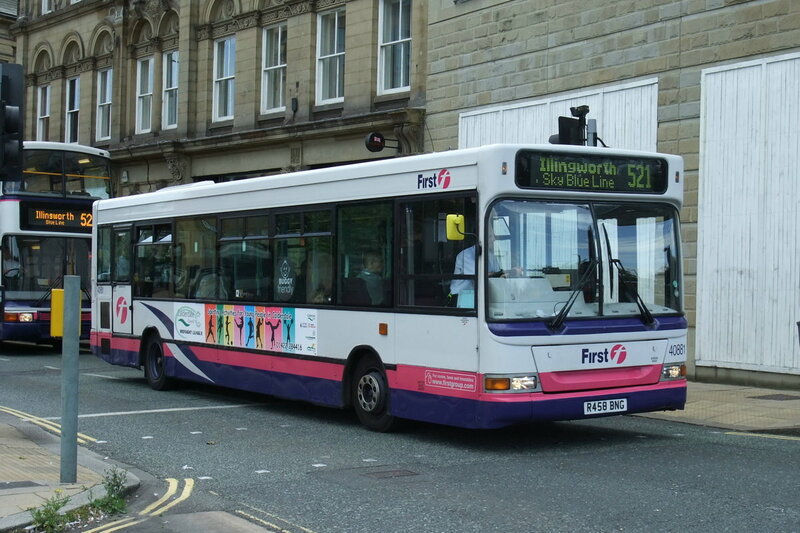 Many days I drove 42718 , a 7' 6" wide Dart, which incredibly , I had also driven at Huddersfield when it was our Yorkshire Riders 4218 !! 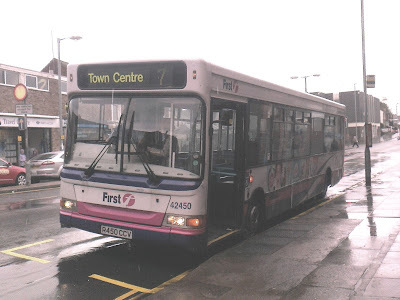 I also drove the last true Great Yarmouth Corporation bus in service on its last day 40007!" After some delay, the last of First's recently acquired Enviro 200s finally entered service yesterday. 44513 DX57SXG had been experiencing a few mechanical issues which, up until then, had kept it out of service. She was observed by Grahame Bessey at Lowestoft's Gordon Road on his way to work yesterday morning. 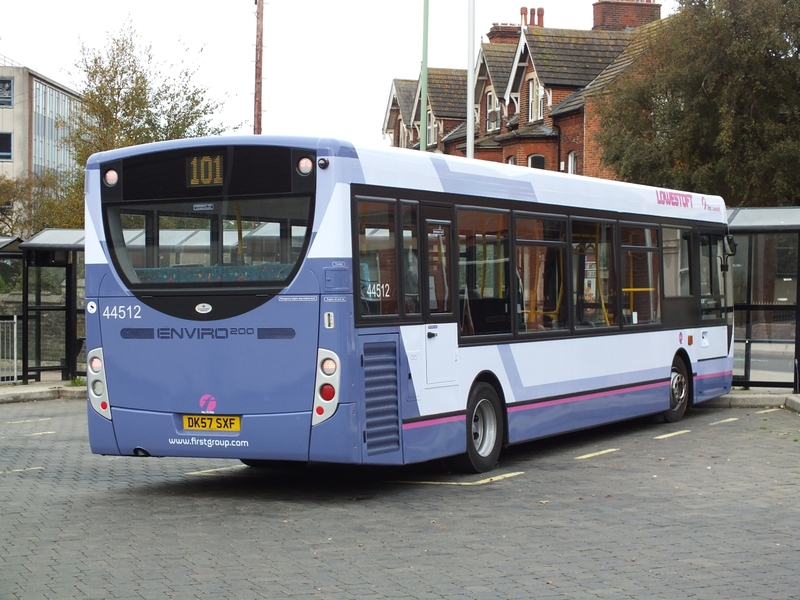 The majority of the X22 journeys between the town and Beccles are now in the hands of the smaller capacity Enviros. The final destination was Market Gates Bus Station where a smart looking Motts Travel Volvo B12M was seen. 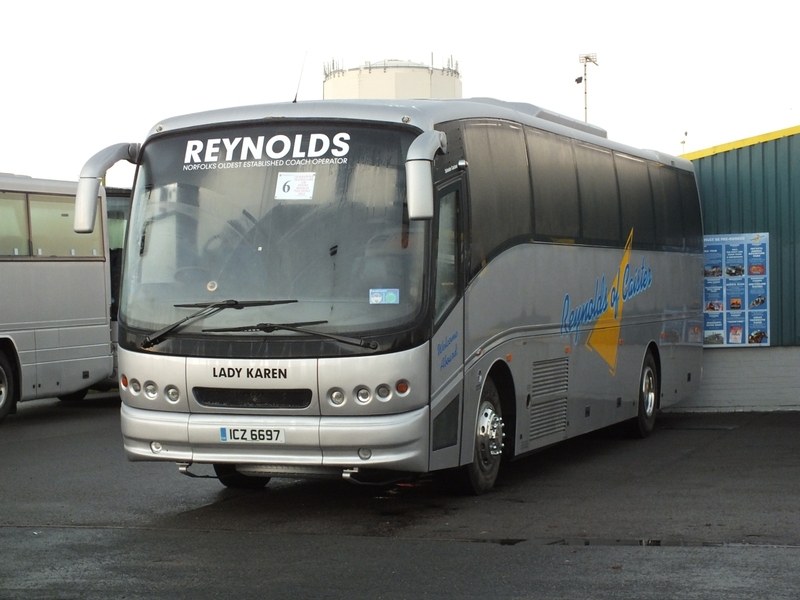 Another piece of news from Reynolds is that Bova Futura BIG6220 has been renamed Lady Kristina. 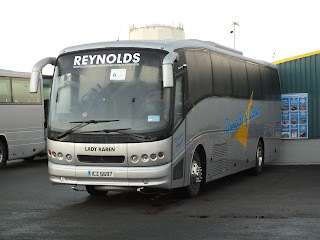 Regular contributor Syd Eade reports that SLF 42446 P446TCV) left Lowestoft this afternoon heading towards Essex. She was driven by a First driver with its destination blinds removed. It seems the 'Green Drive' system has also been removed from the bus so it may be for component recovery rather than further service. A good excuse for a photo of LKD227 taken in November 1972 (just a few months before I passed my test on her) at Kessingland Beach whilst I was the conductor. The photo doesn't show how cold it was!! My driver wasn't very keen to come out of his warm cab in the winter months. 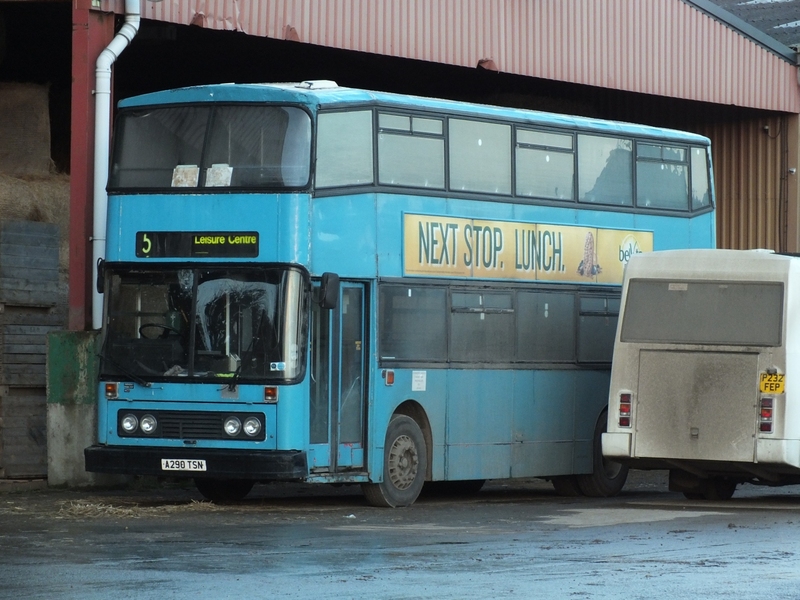 Registered as A290TSN, it has an East Lancs body in light/dark blue livery. My thanks to Grahame for the report and photo - it shows that perseverance pays off eventually! 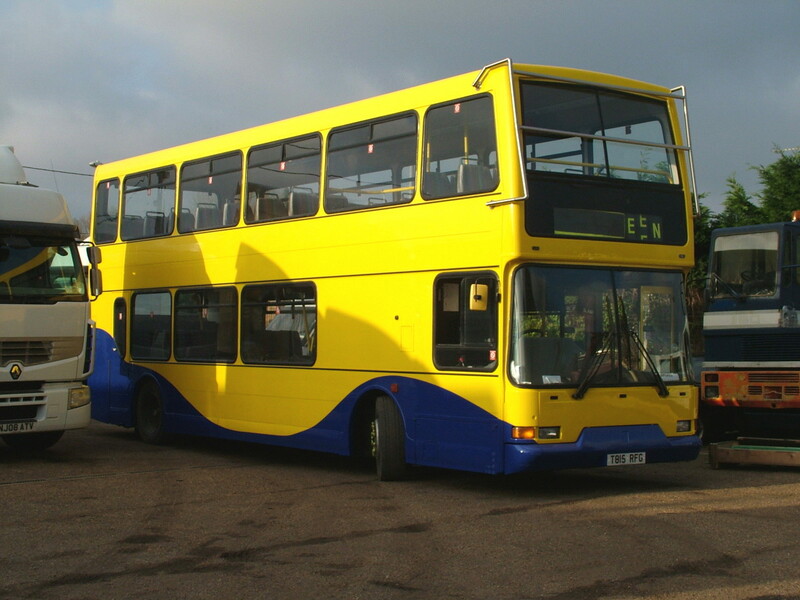 20102 and 43453 have been sold to dealer Alpha Recovery of Weetslade, Northumberland. First Group are apparently no longer using Erith Commercials for disposing of vehicles. 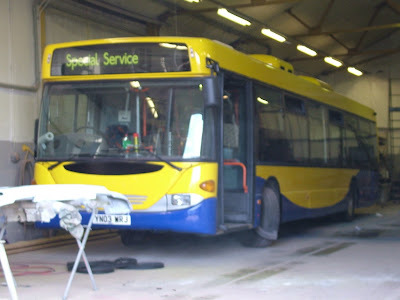 At the same time ex Metroline Scania YN03WRJ is also in for door conversion and a repaint. 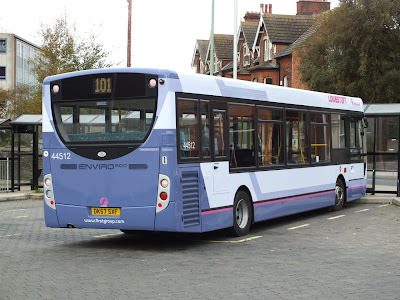 With all the Enviro 200s now entering service at Lowestoft, it seems that there is now a bus photographer on every street corner in the town!! 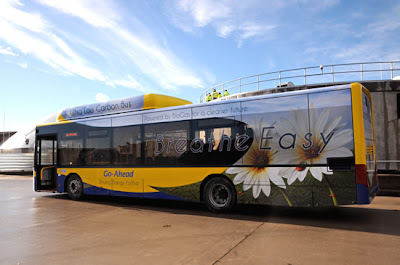 The last of the recently refurbished Enviro 200s, 44513 DK57SXG, was noted on the Caister Road forecourt this morning. 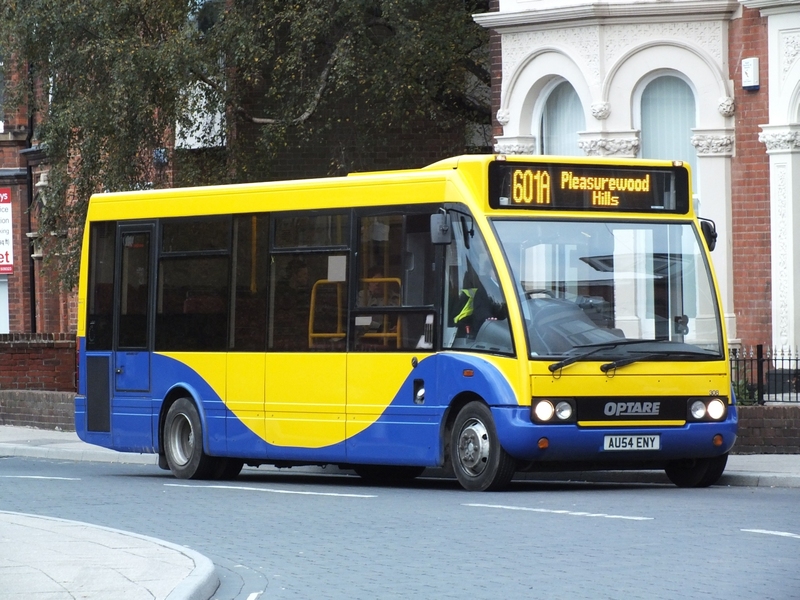 Meantime sister vehicle 44512 DX57SXF was at work on the 101 in Lowestoft yesterday as Grahame Bessey's picture shows.